This is Mallorca's most scenic, wild and dramatic region and one of our personal favourites. Nikki Tinto, i-escape's founder, has been coming here for nearly 20 years. It's dominated by the Serra de Tramuntana, a chain of craggy limestone mountains stretching the length of the northwest coast, from Andraitx to Pollensa. Impressive peaks rising to nearly 1,500m and plunging sea cliffs are intercepted by sheltered valleys of olive and citrus groves and picturesque villages. Of these, Deia is perhaps the pick. Perched between mountains and sea, its steep narrow streets of old honey-coloured stone houses wind their way up to the small church on top of the hill, from where there are spectacular views. The relaxed atmosphere has long attracted foreign artists and writers, most famously the English poet and novelist Robert Graves, who spent most of his working life in the village. Others include the writer Anais Nin, the composer De Falla, and illustrator Arthur Rackham. Nowadays, there are still a few resident artists but it's more of a retreat for well-heeled Brits and Germans, plus independent travellers who enjoy walking, painting and chilling out. It also boasts more than its fair share of top restaurants (see below) and a pretty cove with a pebble beach, reached by a steep track or 40-minute walk. This can get busy in summer; but go out of season and it's all very quiet. Another favourite of ours is Soller which, despite being the largest town in this region, retains a delightful sleepy atmosphere, with old French-style mansions and leafy shaded squares. It owes its prosperity to the citrus fruits which grow in abundance; enjoying a fresh orange juice in one of the pavement cafes is a must. A few kilometres away, and connected by tram, is the sheltered harbour of Port de Soller, which still has a thriving fishing fleet and the region's only large sandy beach. Unsurprisingly, it's very popular in midsummer, not least with visitors from Palma - there's a scenic one-hour train link as well as a direct road. But its accessibility does make it a good base for a week or longer: stunning hikes head up into the mountains (more below), and the tiny stone hamlets of Biniaraitx and Fornalutx are considered two of the most beautiful in the whole of Spain. Two more spots we love. Pollensa (or Pollenca) is a pretty, midsized town in the Tramuntana's northeast foothills, with a vibrant cafe culture and summer music festival. Despite being just a few kilometres from bustling Port de Pollenca and the sands of Cala Sant Vicenc, life here seems a world away from bucket-and-spade tourism. And at the other end, Valldemossa: a picturesque mountain town beloved of the Austrian Archduke Ludwig Salvator, with an impressive Carthusian monastery where Chopin and George Sand famously spent a winter in 1838. With its pretty gardens and Chopin's cell, the monastery is definitely worth a visit, but not in the middle of the day when tour coaches can swamp the ambiance. Small, relaxed ambiance, good service and heavenly modern cooking (lobster ravioli, rack of lamb, filets of red mullet with balsamic dressing, etc). Reservations essential in summer. Go after 9pm to avoid being surrounded by English home county types. Run by Joseph Sauerschell, ex chef of La Residencia's El Olivo. Fine, imaginative cuisine served on a beautiful terrace overlooking the mountains. Service can be slow. Closed Mondays and Tuesdays. Good Mallorquin cuisine served in informal atmosphere amid lovely garden and terracing overlooking the Serra de Tramuntana. Michelin-starred and suitably elegant (and expensive), with dripping candlabras; booking essential. Go for pre-dinner drinks on the terrace one evening, even if you eat elsewhere. If that all sounds too genteel, head along on the main street and up some stairs to this Deia institution for bohemian boozing, reggae-influenced sounds, and live music (at weekends). Don't expect fine food or smarmy smiles; just grab an ice-cold San Miguel and enjoy watching the world go by. The 5-hour hike from Deia to Valldemossa, climbing over the 1,000m Teix ridge and down through pine forests, is one of our favourites - not least because it's a bit of a secret. The ascent is a little tricky to find: it starts from the road that winds up behind the Es Moli hotel. There's a small sign marked Teix, take this and follow the path up through ancient olive terraces and then holm oak woods, following the red paint markers and small piles of stones. Some steep switchbacks bring you out, after about 2 hours, to the top of a barren limestone plateau with plunging views over the sea, and the scent of wild rosemary in the air. Instead of following the “Archduke's path” left to Teix's peak, continue right along the vertiginous ridge and then bear left, down to Valldemossa, through pine woods and past a hermit's cave (still in use). Start early in summer - it gets very hot - and take lots of water. Return to Deia by taxi or bus. A 40-minute walk down through olive groves via Es Clot leads you to a picturesque cove known as Cala Deia. The small pebble beach gets crowded in summer, so best to lie on the rocks to the right beneath the boat house from where you can snorkel in deep clear waters (but watch out for jellyfish). There's a restaurant serving excellent fresh grilled fish (open summer only). In mid summer it's a tough walk back up to the village, so you might want to drive. This is one of the loveliest hikes on the island, and easily done from Ca'n Reus or Ca'n Verdera in Fornalutx. Take the morning bus (or a taxi) from Soller or Fornalutx towards Lluc, and alight at Cuber reservoir. From here, it's an easy hike southwest along the right side of the lake, up to the Col de l'Ofre (1h30), which offers stunning views over Soller; and a further 2h30+ down a cobblestone path through the spectacular canyon of Biniaraix, whose sheer rock walls soar above you. 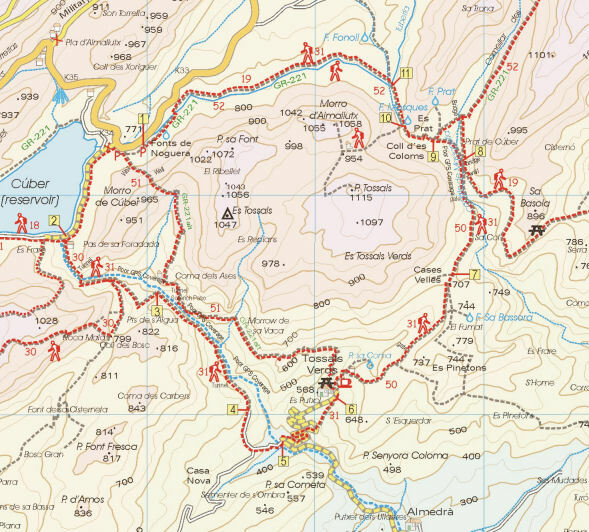 You're following the GR221 all the way, and it's a popular route, so you should be able to manage with a map (there's a good one here, a decent sense of direction, and sturdy knees! From the pretty hamlet of Biniaraix, it's 1km back to Fornalutx or Soller. On the cliff down at the Puerto del Soller. Candlelit tables set outside in summer, and great views of the harbour, make this a romantic evening spot. Mediterranean style with dainty portions. Off the Soller-Deia road - the terrace makes a wonderful lunch spot in summer. Down a long windy road off the main Deia-Soller road, by the sea. A great setting for sunset and serves delicious grilled fish, but service can be slow. Booking essential. Open summer only. Good Mallorcan cooking on a vine-covered terrace overlooking the pretty village. Popular with locals and those wanting to savour hearty soups, fresh squid and roast suckling pig. Located just off the village square. The English owners offer better quality dining than most restaurants (eg. foie gras, scallops, monkfish, seabass, steak, etc) but at a higher price. This estate of Moorish origin, with its cool, fragrant, fountain-filled gardens, is a great place to escape the heat in summer, or to admire colourful blooms in spring (April-June). Highlights are the date-laden palms, green pools and wisteria-roofed promenades. There's also a stately home with 19th-century portraits and furniture, and a bedroom where Queen Isabella slept in 1860. The best way to reach it is on the train from Palma to Soller (the gardens have their own stop); or, by car, go through the tunnel linking Soller to Palma and just as you emerge on the left hand side you'll see the exit. Allow 1-2 hours. In the heart of the Tramuntana mountains, surrounded by craggy limestone peaks and sparse forests, is the high reservoir of Cuber, which supplies Palma with water. It's the starting point for several hikes, including this challenging and varied circuit. From the northeast corner of the reservoir, near the Font des Noguer spring, there are 2 routes to the Tossals Verds refuge, one signed GR221 via the Pas Llis "cable route" (not for vertigo sufferers), and the other following a path built by water engineers along the side of a ravine (take torches for the tunnels). Both take about 2 hours, and are stunning in their own ways. At the refuge you can enjoy a hearty lunch (book here), and far reaching mountain views. Your anticlockwise circuit continues gently uphill, passing a seasonal stream, to the Coll d'es Coloms (800m); and then down alongside a watercourse to the Font des Noguer and your start point. It's a good 5 hours' walking in all; you can find a route description here and a map here. Take proper mountain clothing, map, food, water and money; and don't set off in bad weather. Music lovers should check out the programme of classical music recitals at Son Marroig. This stately mansion was once the favourite residence of the Austrian aristocrat, Archduke Luis Salvator. Overlooking the sea on the road from Deia towards Valldemossa, it's stunning at sunset. The concerts are organised as part of the Deia International Music Festival which runs from May-September. Lovers of Chopin (besides Georges Sand) should head to Valldemossa in August for the Chopin Festival, which draws pianists from around the world. It's not easy to find a gorgeous beach to yourselves on Mallorca, but Platja des Coll Baix - if you don't mind hiring a boat or walking 30-60 minutes to get there - is your best bet. It's near Cap Menorca on the Victoria peninsula, about 5km from Alcudia, on the eastern extremity of our Soller & Mountains region. Families with young kids should definitely go by boat; the more adventurous can hike from the end of Carrer de la Muntana (from Mal Pas head southeast then northeast to the road-end; then 30 mins' rocky walk). Expect bright blue waters, coarse sand, a backdrop of green pines and limestone crags, and a smattering of passing boats for company. Take plenty of water, snacks and (if boating) a parasol. Would you like to see only family-friendly places while browsing our site? Please enter your email address below, and we will send you a link to reset it securely. Thank you. Your password reset email has been sent. Please check your inbox now, but remember that it may take a few minutes for the email to arrive. If you don't receive an email please check in your junk/spam folder.